An untrained artist, Reece Crawford creates whimsical, figurative, and relief sculpture using paper mâché. Born in 1955 in Springfield, Massachusetts, Crawford moved to Omaha, Nebraska in 1969 when her mother remarried. After graduation from Bellevue East High School (near Omaha) in 1973, she worked periodically as a singer, a seamstress, and a cytology clerk. Crawford began creating her works in 1989 during the free hours from her then full-time job with an Omaha software company. After awaking night after night with visions of individuals in her African American community, she was compelled to recreate them in three-dimensional form, first utilizing sawdust and water. The pieces fell apart, and soon Crawford turned to her day job for help and asked if she could use the shredded paper from the company. She combined this paper with Elmer’s glue and a Downey/Clorox mixture to develop a successful material to shape. Crawford would wake up in the very early hours of the morning after a vision, work on a face until she had it right, go back to sleep, and later figure out the rest of the body. The finished paper mâché figure was then painted with a commercial paint, and, in later works, she sometimes added dolls’ eyes and hair purchased at local hobby shops. While the works are caricatures of the people in the artist’s community, they are sensitive and loving portrayals that she considers an ode to her neighborhood. Many of her sculpted figures emit a feeling of lightness and joy, while alluding to issues confronting African American communities. 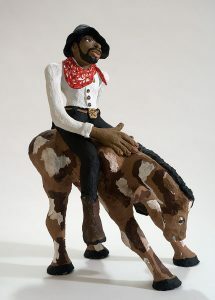 Crawford’s work has been exhibited in Omaha at the Great Plains Black Museum, Gerald R. Ford Conservation Center, and Artspace. In 1993, Crawford was awarded a Regional Visual Arts Fellowship by the Mid-America Arts Alliance and the National Endowment for the Arts. In 1997, she and fellow Omahan Pamela J. Berry collaborated with Flo Oy Wong on an installation, Kente Rice Women: Talking our Connection, at the Japanese American Museum of San Jose, California that explored Wong’s friendship with the two African American artists. Now widowed, Reece Crawford Tocho-Duchine lives in Cypress, Texas. Reece Crawford was included in the exhibition A Greater Spectrum: African American Artists of Nebraska 1912-2010 on view at the Museum of Nebraska Art from December 4, 2010 to April 3, 2011. The Museum of Nebraska Art has seventeen works by Reece Crawford.